When her friends suggest that Bashville is the perfect place for Pepper to start her Party Planner business, she packs her bags and heads for the big city. 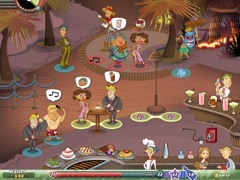 She arrives to the swanky town of Bashville to jump-start her career as the town's party planner extraordinaire. Help Pepper put together the best parties for the creme de la creme of Bashville's society pages in 75 levels of fast-paced, frenzied fun. Plan a backyard BBQ, sun and surf at the beach, a glittering art show, an upscale gala event, and many more. Pick the perfect decorations, drinks, snacks, and entertainment. Keep the mood festive, the guests happy and the conversations flowing with special power-ups to make sure everything runs smoothly. Keep everyone in a partying mood and hire help to make sure everything runs smoothly. 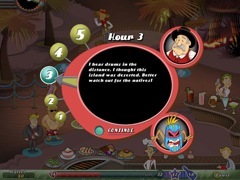 An original twist on time management fun, Party Planner features non-linear gameplay, more than 60 crazy characters, fantastic graphics, and much more. 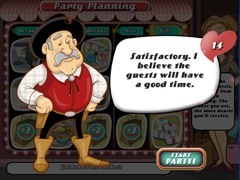 If you enjoyed helping Sally set up her Salons and Spas, you're going to love the parties Pepper has planned!